Crispy vegetable pakoras recipes are the easiest Indian snack /appetizer which are prepared with chickpea (besan) flour and spices. They are super easy and quick.crispy spicy and yummy pakoras are ready just 15-20 minutes. These pakoras are best to serve in the evening time with tea and especially Ramadan month it is a highlight during iftar time is a special snack. It’s very easy and quick to make awesome with chili and tomato sauce. pudinas dip. In India, this snack in which everyone enjoys during the rainy or monsoon season and in the winter. Veg pakodas is known as bhajia also. Here you get four type of pakodas recipe as potato, onion, cauliflower, spinach leaf. Take a big deep bowl add besan, rice flour, allspice, green chili, fresh coriander mix it well then start to add water slowly mix well using a whisk until smooth better ready then add1-2tsp warm oil and soda. The batter should not thick or liquidy. Heat the oil in a deep nonstick pan or kadhai,take4-5potato slices dip in the prepared batter and drop it in hot oil. Deep fry on a medium flame until they turn into golden brown on both sides. When pakoda is ready to take down to a kitchen towel-lined plate and sprinkle chat masala. Serve immediately potato pakoda with green dip, green chutney tomato sauce. Take a big bowl add besan, rice flour, allspices, sliced onion, green chili, salt mix well very slowly with hand if need then only use water because of onion released water own its own. Heat the oil in deep nonstick pan or kadhai and fry onion pakoras in oil until crisp and golden brown both side. 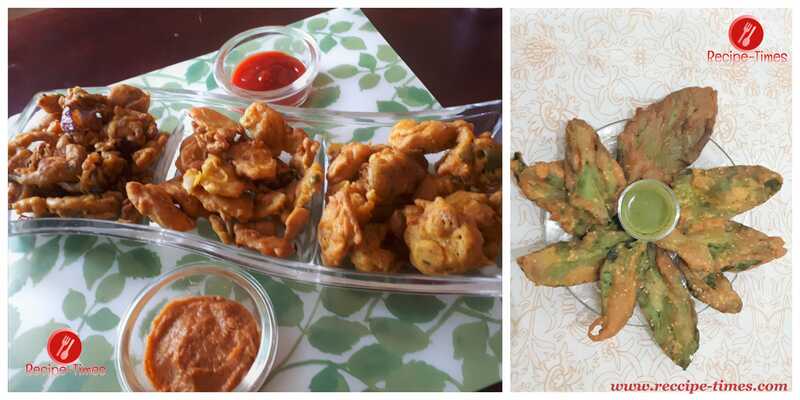 Serve immediately pakoda with green dip, green chutney tomato sauce. Take a deep big bowl add besan, rice flour,ginger-garlic paste, green chili paste and all spices, salt approx 1/2 cup of water and mix well with a whisk till smooth batter ready, add warm oil and baking soda. Heat the oil in a deep nonstick pan or deep kadhai, dip few cauliflower pieces in prepared batter and drop one by one in hot oil. Deep fry on a medium flame until turn golden brown color on all side. Take a big bowl add besan, allspice mix well, make it little thick and smooth batter with water add1-2 warm-oil and baking soda. and gently fry in the hot oil. Fry the spinach pakoda till golden and crisp, drain spinach pakoda or fritters on a kitchen towel to remove excess oil and sprinkle chat masala. Serve spinach fritters or pakoda hot with green chutney or tomato sauce.